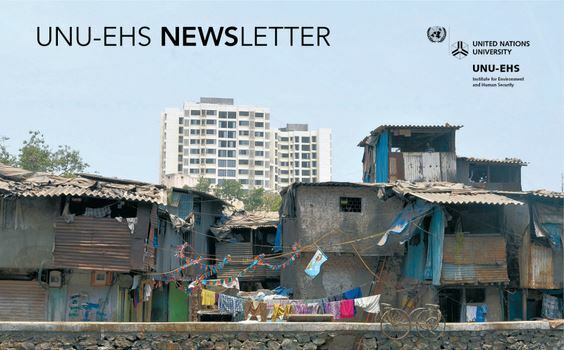 It is my pleasure to welcome you to the first edition of the new quarterly UNU-EHS e-Newsletter. These are exciting times for UNU-EHS. From researching livelihood resilience in rural Bangladesh to analyzing water quality in the Mekong Delta to assessing the risks and vulnerabilities in mega cities, UNU-EHS is generating firsthand knowledge on the role of environment for human security. Our experts are bringing together leading academics and practitioners in conferences and workshops focused on the SDG debate, climate change, disaster risk reduction, livelihood resilience and other themes. Our extensive network allows us to approach critical issues and research questions comprehensively, making a lasting impact on the ground as well as in international policy debates. In the Joint Master course “The geography of environmental risks and human security” with the University of Bonn, the first group of students is completing their degree this fall, while a second group has already commenced their second semester. Students come from all over the world. From Taiwan and Cameroon to the Netherlands and Germany, students bring with them diverse backgrounds that include development studies, sustainable development and disaster mitigation. They contribute a great wealth of ideas, experiences and backgrounds to UNU-EHS, while benefiting from a curriculum that combines internships with field trips and lectures. At the same time, more than a dozen PhD students are currently working closely together with our senior experts on research projects. With so many initiatives, projects, and field work being undertaken, involving many outstanding researchers and experts, we want make sure we regularly communicate our work and findings to all of you. Our new e-Newsletter and the re-launch of our website are important milestones in this direction, and I cordially invite you to read along and find out more about us. You can also receive regular updates on our Twitter and Facebook page.